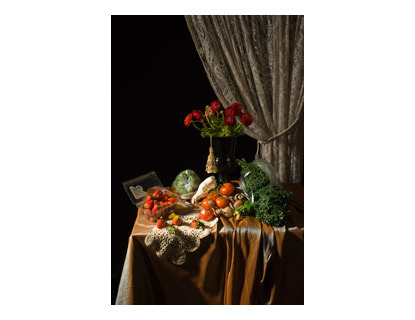 Still Life With Strawberries is an edition of 50 archival photographs measuring 9.5"x14" and printed on Hannemuhle 308. I am creating a series of still life photographs focusing on the way our purchased food is packaged and consumed. By setting common foods in their packaging and labeling direct from the grocery store into traditional nature mort compositions, our most common and necessary items of life – food – are jolted into historical focus. The viewers’ various degrees of knowledge of Dutch still life paintings will be the measure by which the photographs will either found or further the perceived rift between ourselves and nature, and ourselves and our food sources. Bio: Stephanie Dean attended the California College of Arts (San Francisco & Oakland, CA) where she received her Bachelor’s of Fine Arts in Photography. In 2005 she earned her Masters of Fine Arts in Photography from Columbia College, Chicago. Her photographic thesis was the body of work “?Boys/Men?” asking the question of when do modern boys become men. Her written thesis was on existentialism in Robert Frank’s The Americans. She has taught at Columbia College Chicago and is currently teaching the History of Photography at Oakton Community College in Skokie & Des Plaines Illinois.